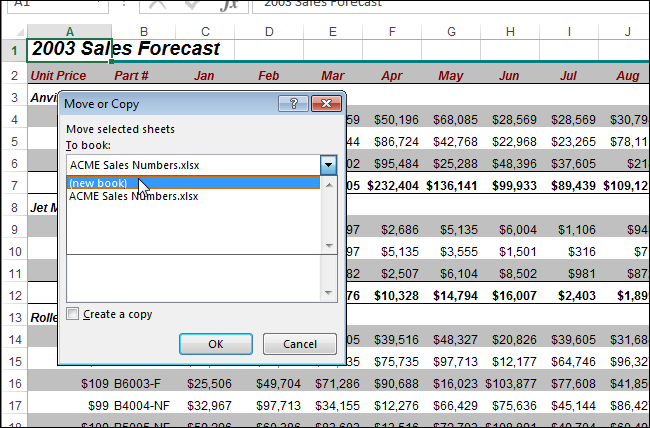 There may be times when you need to copy or move a worksheet into another workbook in Excel or make a copy of a worksheet in the same workbook. Maybe you want to make changes but preserve the original worksheet. First, we’ll show you how to copy a worksheet from one workbook to another whether it be an existing workbook or a new one. Right-click on the tab for the worksheet you want to copy and select “Move or Copy” from the popup menu. 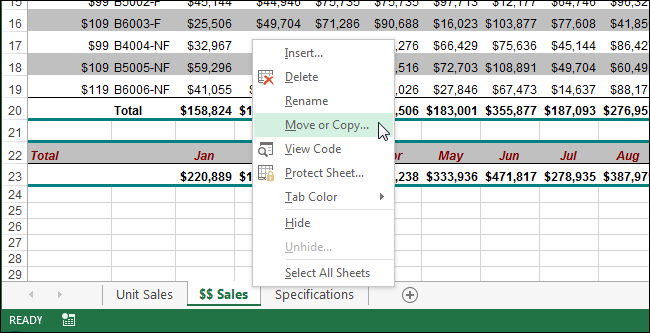 On the “Move or Copy” dialog box, select the workbook into which you want to copy the worksheet from the “To book” drop-down list. NOTE: To copy the selected worksheet into an existing workbook, that workbook has to be open. If the workbook into which you want to copy the worksheet is not open, it will not be available in the “To book” drop-down list. We’re going to copy the selected worksheet into a new workbook, so select “(new book)” from the “To book” drop-down list. Select the “Create a copy” check box. Because we’re creating a new workbook, there are no worksheets in the “Before sheet” list before which we can insert the copied worksheet. It will be the only worksheet in the new workbook. NOTE: If you want to move the worksheet into the other workbook, do not select the “Create a copy” check box. Click “OK”. A new workbook is created and the worksheet is copied into it. If you chose to move the worksheet, it will no longer be in the original workbook. You can also make a copy of a worksheet in the same workbook. You may want to do this if you want to make changes to a worksheet, but you don’t want to change the original. Open the “Move or Copy” dialog box the same way we described earlier in this article. By default, the current workbook is selected in the “To book” drop-down list, so don’t change that. 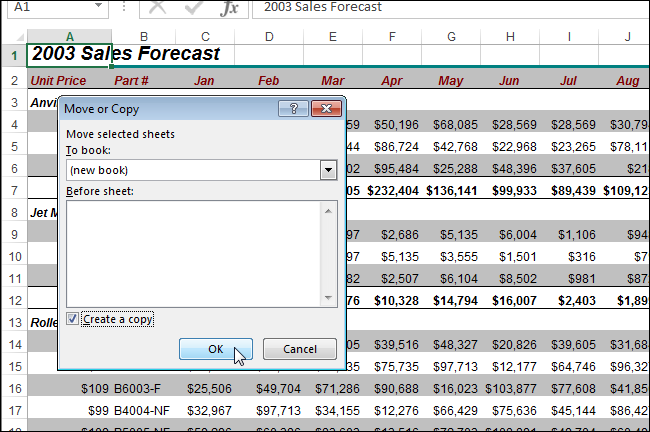 In the “Before sheet” list, select the sheet before which you want to insert the copied worksheet. We’ll choose to insert the copy of the worksheet at the end of the current worksheets. Select the “Create a copy” check box and click “OK”. 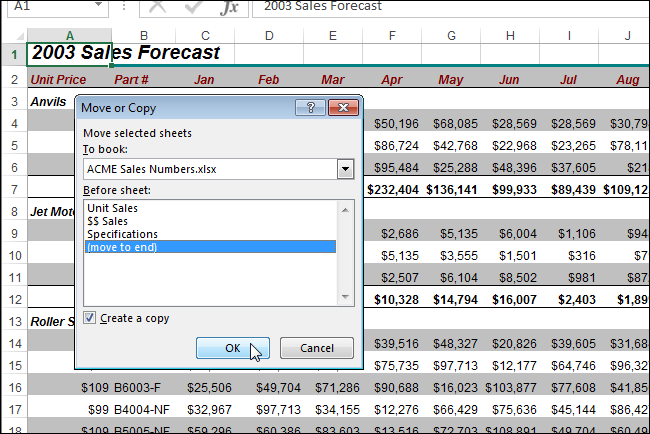 The worksheet is inserted to the right of the current worksheet tabs. This feature is a handy way to rearrange your worksheets and workbooks. You may need do something such as providing only a certain worksheet from a workbook to someone without sending them the whole workbook.